In my last post I said I would be doing a few gift guides over the next few and I had actually planned to have this post and a few others up by now. However about a week and a half ago I started to get toothache - defiantly the worst pain of my life - so I've just wanted to sleep away the pain, and have had no motivation to do anything. I had such big plans to try and blog every day of December that were ruined. I'm pain free now though and will hopefully try and get back in to blogging in the next couple of weeks. 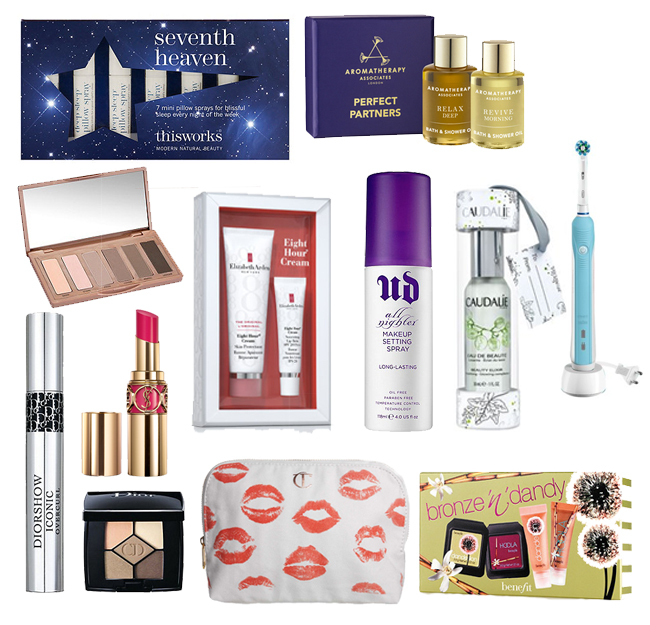 So I have my beauty gift guide that is £25 and under. I have a few of the products on this list, but will be looking for the rest in the Christmas sales - I'm probably more excited for sales than I am Christmas - however the other products are from reputable brands or have rave reviews so will be a hit with any beauty lover. I'm particularly wanting the Charlotte Tilbury Makeup Bag which is so cute! What presents are you looking for this year? Hopefully I've provided some inspiration! Super nice ideas and lovely post! :) I will definitely purchase some of those haha i always struggle finding the right presents! The little Dior palette is so cute ^-^ Great picks.